Over the last 30 years, Opel has developed different camouflage foils and artificial add-on components in order to ward off spy photographers from getting highly detailed shots of something in development. The reason for this is to (if you couldn’t tell) keep the design of the vehicle hidden until it’s launch date, because the luster isn’t all that spectacular when you know what’s coming. In the case of the 2016 Astra, Andreas Kubis, has been successfully disrupting the attempts of automotive paparazzi. Kubis, a certified technical manager, has started using a camouflage that implements the 3D effects of “Cube” camo. This camouflage will make the car seem blurry and confuse onlookers, a strategy that was useful during the development of the Corsa. An important part of the new Astra that Kubis paid close attention to are the headlights. Ideally the shape of the lights are to remain hidden, too, since it is a recognition factor and characteristic for every Opel. 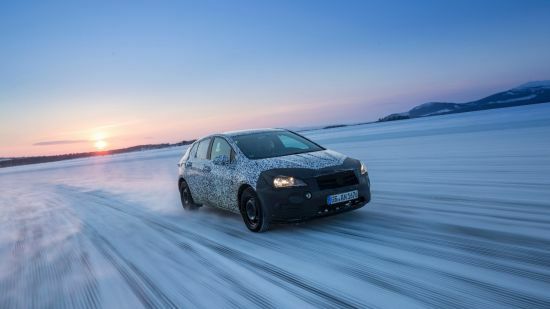 Opel is stepping up their game for the all-new Astra K, and for the first time ever an additional privacy foil will be used for the interior of the vehicle. It will cover the center console and infotainment system of the brand new prototype, and works similarly to the privacy screens you can get for your laptop or cell phone. This privacy foil is strong enough to take on even the most powerful zoom lenses. But nothing is invisible, and we’re sure to share with you news of a new GM prototype vehicle being spied on public roads again soon. If you want to see what the new 2016 Opel-Vauxhall Astra will look like, you’ll have to wait until it’s official debut at the 2015 Frankfurt Motor Show this September. renault works MEGAN and LAGUNA-LAGUNA kombi. I’m sorry gm automotive industry. gm is very weak. than the previous leadership was killed when I put in jail those gm gm previous leaders.